In Cub Scouts there are so many different “little” things the Cub Leaders can do to help keep their boy motivated or to use as an incentive! But, one that I found that works wonderfully are CUB BUCKS! Back when I was a Den Leader I used them to encourage the boys to do 4 things each Den Meeting: 1) Wear their uniform 2) Wear their Neckerchief 3) Bring their book and 4) Be on-time! They would get 1 Cub Buck for each of the 4 tasks that they completed. I would also then use them to reenforce good behavior. If I saw one of the boys include a boy that was being left out, I would later take them aside and let them know how proud of them I was and would give them a Cub Buck or two! To help the boys keep them from getting lost from week to week, we would suggest they tape an envelope backwards in the back of their book and then they could just put all their cub bucks in there each week. This also supported our goal to have them bring their book each week! Then once a quarter, at a Pack Meeting, our Pack would set up a Cub Buck Store and the boys could come purchase items using their Cub Bucks. We for the most part just ordered fun little toys off of Oriential Trading, but we would also purchase some smaller treats and full sized candy bars. Then we would also get a few fun items from the Cub Scout Store like hats, belts and books. We would set reasonable prices – most items were just 1, 2 or 3 cub bucks. 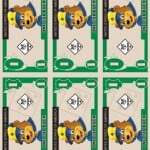 Then some of the larger items would be 5 cub bucks. We wanted all the boys to go home with a couple items! The boys LOVED it and looked forward to it each and every time! If you are a part of a Pack that has a smaller budget, don’t be afraid to let the parents know that you love donations! We would just mention it every once in a while and then sporadically a parent would donate some items to include in the Cub Scout Store! I wanted to throw in here you can print these in black and white if you want to save money. Our Pack just printed them on cardstock, although now if I were to do it I would print and then laminate them. After the Cub Buck Store we would re-distribute the used bucks to our leaders to pass out in future weeks and re-use. They were for sure not a one time use buck! Hope this gives you a little inspiration! The Cub Buck program can really be used in any way shape or form that your little heart can imagine! You can download the Cub Buck PDF below! I love the idea for cub scouts. I do this in my Math Learning Lab as our financial literacy unit. 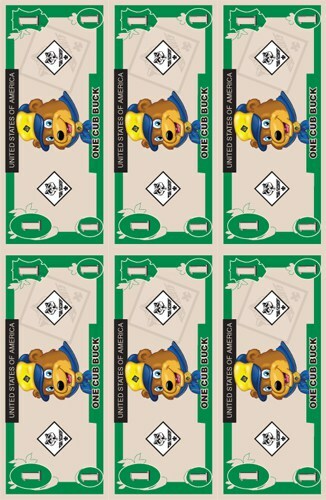 I am also going to use the cub bucks for the kids to purchase tickets at the Bears Carnival. Thank you for the idea and printable money. i love this idea, but download doesnt work! ive tried and tried! prints in all kinda crazy colors, ie the bear is red! I don’t suppose I could get the original source file for this? I love your design but would like to have different denominations. Thanks! I’m sorry Derek. We can’t release our personal files on this. Thanks! Sorry about that Tabatha! The download is fixed! We had some issues with some of the downloads when we changed website templates last week! We’re doing our best to get them fixed! Thanks for your patience! Great idea! I will start implementing some of these ideas as Committee Chair and Den Leader. Love this idea!! Taking it to the committee to see if we can start right away.